New Technology Makes Resident Connections, Communications Easy - Grace Ridge Retirement Community - Morganton, N.C.
During a recent late-night visit to Grace Ridge Retirement Community’s health care wing, Executive Director Chris Romick got caught up in a lively game of “Name That Tune” with assisted living residents. Name the Cookie is one of the new games residents play through LifeShare. “It was hilarious because they blew me away with their knowledge of 1950s music. And the best part is, we didn’t need any complicated devices to play. All we needed was a simple remote control and television,” he said. Games are just one example of the on-demand activities available through LifeShare Technologies. The campus-wide system is designed to enrich residents’ living experiences and help them stay better connected with family and friends. Large televisions in independent living, assistant living and memory care play videos, music, faith programs, news, weather and podcasts. The technology also displays photos, menus, activity calendars, announcements, birthdays and memorial recognitions. “Both residents and staff are responding well to this new communication system, especially since it’s so easy use. Everyone loves seeing photos from all the events and activities happening in and out of our community,” Romick said. The system’s mobile apps – designated for independent living, skilled nursing and memory care – give family members a convenient communication tool to stay connected with loved ones and care providers. 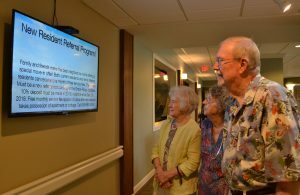 New technology allows residents to stay better connected and informed. Residents also have the option of adding the technology in their home. 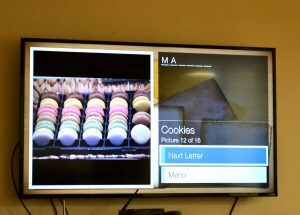 “This is an extra amenity many residents are interested in because they can look at anything displayed on the TVs downstairs from their living room,” Romick said. Grace Ridge also is replacing the paper log book at front reception with Accushield, a visitor management system. Families, friends, third-party caregivers and other vendors will use a touchscreen to sign in and out. A sign-in tablet capture everyone’s photo and prints a visitor’s badge. Not only will the new system simplify the sign-in process, it will help improve community security by verifying the credentials of outside vendors through instant background and license checks. One of the coolest features of the new system, however, has less to do with security and more to do making sure residents are getting plenty of attention.